We have been receiving a lot of requests lately for a review of the Lenovo Chromebook 500e that launched back in February. For those asking, I do have the Lenovo in my possession and, after a much-needed week of vacation, I will have the full review for you upon my return. I’ll save the juicy details for later but I can tell you that, for around $300, the Lenovo Chromebook 500e is a good buy for the money. The convertible design, garaged stylus and sturdy build will make a great device for the average user and even more so for student types. 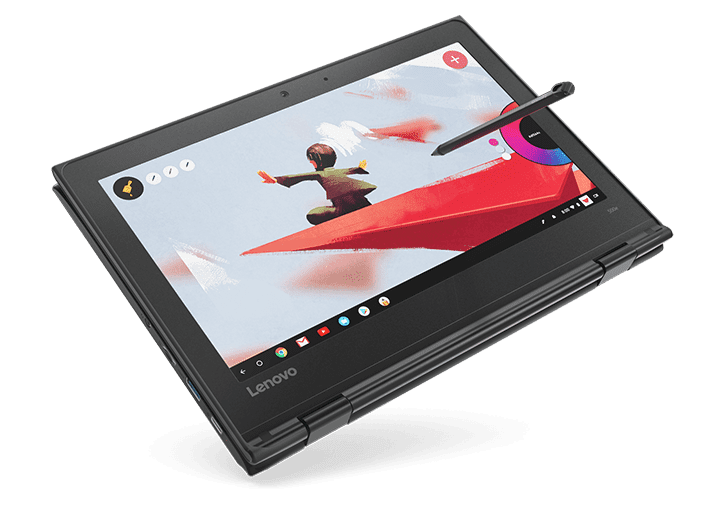 Unbeknownst to me, Lenovo had an upgraded variant of the 500e in the works and thanks to an email from Brian D., we now have a listing for an 8GB/64GB model of the Chromebook. Apart from the RAM and storage upgrades, the second iteration of the 500e is identical to its $300 sibling. Currently, the upgraded model is only available from EDU resellers and Best Buy’s business program. From what I can tell, you can sign up for a Best Buy Business account with little hassle and purchase directly from their website. The 8GB of RAM definitely give a little boost to performance but where you’ll likely notice a difference is tab management. Chrome has suffered some setbacks in the memory management department as of late so the doubled memory will surely keep your workflow moving more smoothly. In addition, the 64GB of storage will be a plus for business users as well as those looking to use a variety of Android apps. If you’re interested in the new 500e, here’s a couple of links where they are available.